To tell the truth, I rarely–if ever–pull that card because (1) why on earth would I want to be that guy and (2) you don’t need a TV to watch TV these days. With Netflix, Hulu, Amazon Prime, and even YouTube, you can watch plenty of TV without technically owning a TV. And we do watch these things. Mostly in moderation. Sometimes not. So definitely NOT that guy. Right??? I’ve mentioned before how I’m conflicted on screens. We’ve struggled with this in the past. I don’t think TV is evil. I think some shows are very good. I watched plenty of TV growing up. The struggle is with transitions for Henry. That kid–if you let him–would watch TV all day every day. When you try to turn it off, he rages. Like serious, ugly, violent rage. Doesn’t matter if you agreed about what show will be watched in advance, and he seemed to buy in. Rage. After awhile, I decided that the struggle just wasn’t worth it. I would rather not even start a show than have 30-60 minutes of peace followed by Henry going full on rage biscuit. Which is the other half of the puzzle. TV is a lousy temporary babysitter for me because Mac has very little interest. He’ll watch about five minutes of something before he quits and starts following me around or making mischief. He has started to watch a little more, but his interest is definitely unreliable. So what to do? I had one kid asking about TV constantly. I didn’t want to commit to being 100% TV free, but I didn’t want to struggle with always negotiating TV. Enter Friday Night Movie Nights. We started this a few months ago, and it has been really working for us. 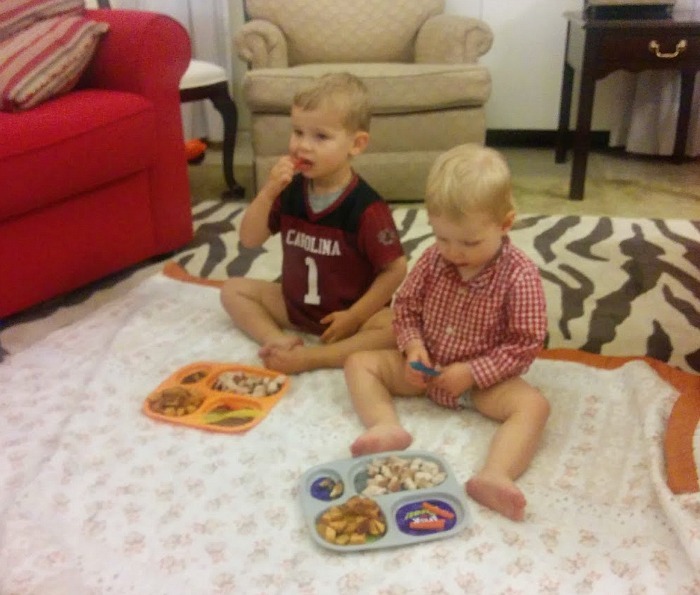 On Fridays, I spread out a blanket for an indoor carpet picnic, and we watch a movie as a family with dinner in the living room. Depending on the length of the movie or when we get started, we might also watch a few shows. We could watch anywhere from two to four hours of programming. 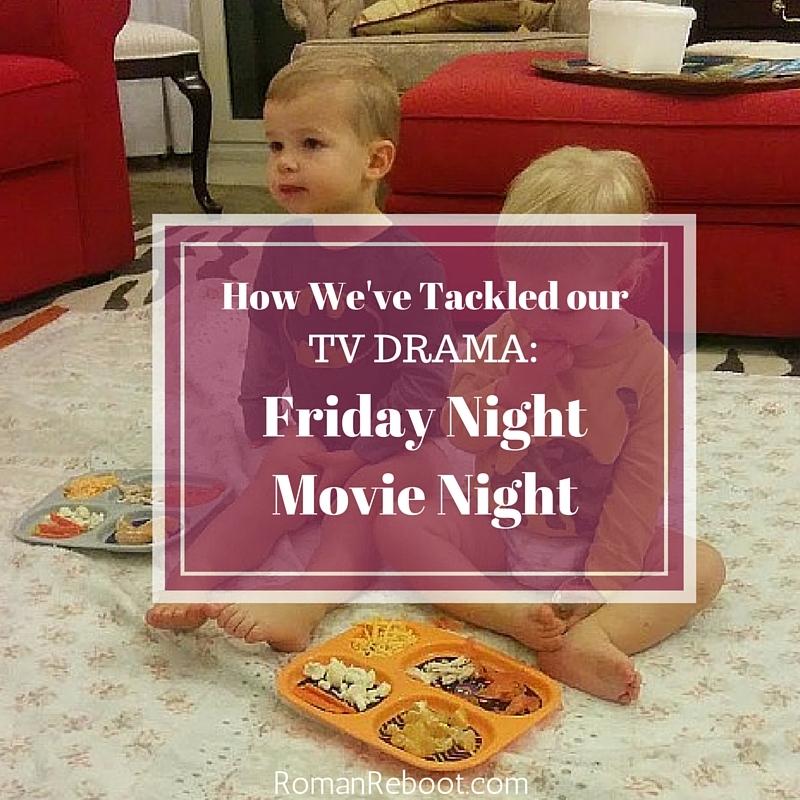 If Henry asks about a show during the week, we make a note to watch it on Friday night movie night. This actually works surprisingly well. He generally seems appeased. We make a note. He moves on. I like a lot about the current regime. I like that it is something we do together. I like that it is something we look forward to. I especially like that I don’t field nearly as many TV-related questions. This won’t always be our system. But it is really working for us for now. How do you handle TV? Are family movie nights a regular part of your routine? Pants optional. Obviously. Because, you know, pants.